Plans to create an artificial reef by sinking a ship off the Dorset coast have been met with a lukewarm reception by a potential investor. Wreck to Reef wants to sink a Type-42 destroyer in Balaclava Bay, Portland, to encourage divers to the area. The not-for-profit group is hoping the Regional Development Agency (RDA) will fund the estimated £1m project costs. But the RDA said in the current economic climate the scheme was not a priority and it had other commitments. HMS Scylla became Europe's first artificial diving reef when she was scuttled off Whitsand Bay in Cornwall almost five years ago. Tony Bray, South West RDA's Dorset director, said: "We have had some initial contact with Wreck to Reef but have made absolutely no commitment to fund the project." He said their main focus was on existing commitments like the £40m Osprey Quay development on Portland as part of the area's 2012 Olympic programme. "We have agreed to meet with them [Wreck to Reef] but our main focus at the moment...is funding regional support for businesses to help them survive in light of the rapid economic slowdown and the credit crunch, rather than making new investments." 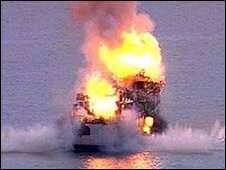 Neville Copperthwaite, project leader from Wreck to Reef, said he hoped a destroyer could be obtained for about £130,000, decommissioned and sunk by the end of next year. "Just because the RDA has said this, it does not mean we are going to give up," he said. "If they refuse to help we would then look to EU funding. "The government is saying it wants to bring public works forward to boost employment and this project would boost the local economy for years to come. "This is an investment they should be backing." He said local councils have been positive while the Crown Estate has no objections to the scheme. Portland Port Authority, which has jurisdiction for the waters, has previously said it would not comment on the plans at this stage.